Meadowbrook Cooperative Preschool is a not-for-profit school providing quality education to children aged two to five years old. We are a warm and welcoming organization offering three classes: Pre-3s, 3-5s, and Pre-K. Our emphasis is on trusting children to learn when presented with age appropriate, interesting and diverse experiences and allowing them to find their place in a safe and stimulating environment. Our large classroom is bright and airy with two lofts and an open feel. We also have a large outdoor play area that includes a grassy hill and natural play area, climbing equipment, paved space for balls and tricycles, and a large sandbox. 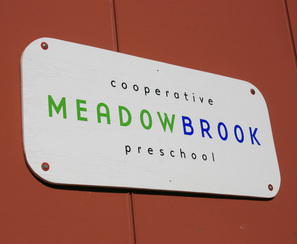 Meadowbrook Co-op is part of North Seattle Community College Cooperative Preschools (NSC). Children in Meadowbrook's classes spend most of their time at school engaged in play. This is the work of children. Play nurtures every aspect of a young, developing mind and body. Through play, children explore and build tools for navigating language and society, while feeding their physical and emotional intelligence, promoting self-esteem and confidence, and developing creative and independent thinkers, with respect of the child's own uniqueness and style. Teachers create an environment that supports, challenges, and expands this play. Children are encouraged to work together through negotiation and cooperation, teaching the value of teamwork, building social skills and creating a sense of community. Each class comes together to share snacks and circle times with teacher led singing, dancing, games, and stories. Together the teachers and parents ensure a safe space for emotional and physical exploration and building language, social, and ﻿﻿pre-academic skills. We do allow "babes in arms" in our pre-3's and 3-5's classes. Newborn infants up to six months of age are allowed to attend class with the enrolled parent. Please inquire for more details. Registration is happening now for the 2019 - 2020 school year. We still have openings in all our classes! Classes begin in September. Registration is on-going throughout the school year. Thank you for checking out our programs. Please call or email us so we can show you what we're doing. You are welcome any time! Click here for our contact information. All are welcome to join us for this fun event! We will have live music, great food, and lots of space for the kids to run around! Everyone is welcome to join us, we hope to see you there! Meadowbrook Cooperative Preschool was again voted one of the top 20 preschools in Seattle by Expertise! Find out more!